The Co-operative Union of the Slovak Republic was established simultaneously with the establishment of the Slovak Republic, which means that in 2003 it celebrated its 10th anniversary. The Constituent General Assembly was held on December 29, 1992, in Sobotište. Delegated representatives decided that members of Co-operative Union of the Slovak republic would be the following ones: SZVD - Slovenský zväz výrobných družstiev (Slovak Association of Producers’ co-operatives), SZSD – Slovenský zväz spotrebných družstiev (Slovak Association of Consumer Co-operatives - currently COOP JEDNOTA Slovensko), SZBD – Slovenský zväz bytových družstiev (Slovak Association of Housing Co-operatives) and ZPD SR – Zväz poľnohospodárskych družstiev SR (Association of Agricultural Co-operatives of the Slovak republic - currently ZPD a OS SR – Association of Agricultural Co-operatives and Companies of the Slovak Republic). The Co-operative Union of the Slovak Republic represents the highest coordinating body representing the interests and development of the co-operative movement in Slovakia in the new conditions that arose after 1989 and then 1993. The Co-operative Union of the Slovak Republic, together with its member associations plays an important role in creating favourable conditions for all activities of co-operatives in the state, in relation to the national authorities of the Slovak Republic, as well as towards international bodies and organizations. The Co-operative movement in Slovakia has played a major and important role both in the economic and in the social areas during its 158 years history. It has contributed significantly to the development of villages and towns and therefore whole regions and by fulfilling its primary aims it has satisfied not only the needs of its members but also the needs of other residents of Slovakia. We can say that even in the current period co-operatives represent a crucial element influencing the development and independence of the Slovak Republic. After major transformational changes which affected co-operatives in the '90s, in 1989 and in 1992, co-operatives have currently got a second wind and step by step they are leading to its stabilization and continuous development. 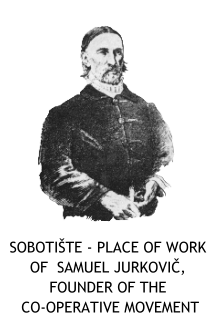 He laid the foundations of co-operatives in Slovakia by founding the Farmers’ Club on February 9, 1845 in Sobotište. All those who have benefited from the activities of this kind of associations, although there were not many of them, must recognize that they have been helpful and useful. Whatever is said, it’s true that our poor and scattered nation necessarily needs these kinds of associations, in the interest of its material and spiritual well-being. Only then it will stand on its feet it unifies its efforts.